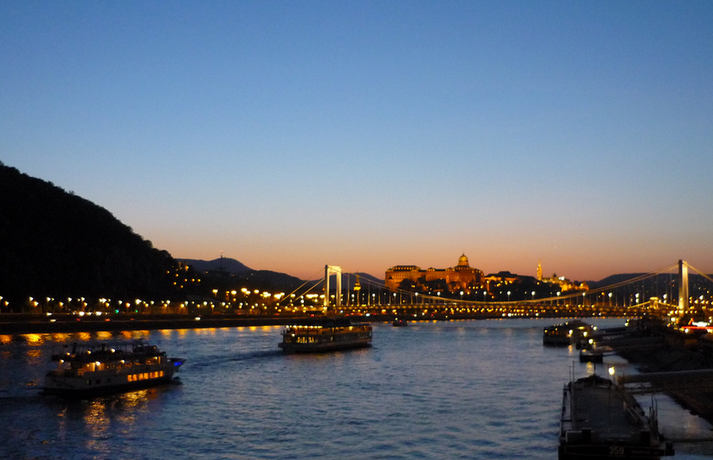 Budapest Easter breaks can be perfect whether you are a Christian or a non-Christian visitor. True, there are several places with modified opening hours, and some places are closed at Easter, but there will be lots of great things to do to enjoy an Easter weekend getaway in the city of Budapest, like the Buda Castle Easter Festival. But Budapest activities are more versatile, and besides the Easter events, there will be other things to do. Generally speaking, the Easter holidays are celebrated all over Budapest, and of course in Hungary, where the vast majority of the population is Christian, (even if many people are not church goers). Easter Sunday and Easter Monday are public holidays in Hungary, when some things are closed, most notably the shops, shopping malls, Budapest market halls. Other Budapest attractions, like the Budapest baths, Szechenyi Baths, Gellert Baths, etc. will stay open, and several Budapest activities, like Easter cruises in Budapest will be on. In Top Budapest travel guide we have collected some Easter break ideas, things to do on Good Friday, Holy Saturday, Easter Sunday and Easter Monday. Now let’s see what to do during the Easter weekend break, what places to see at Easter in Budapest. Easter in the Buda Castle on the Castle Hill (in fact a gastro and cultural fair and 3 day mini festival): the Easter festival in the Buda Castle on the Castle Hill is called the Budavari Husveti Sokadalom. The Easter Festival in the Buda Castle is the most spectacular event in the city of Budapest during the Easter weekend break, with many concerts, lots of nice Hungarian foods, handcraft fairs, folk dances, etc. The Budapest Easter Festival on Vorosmarty square seems to be the spring counterpart of the popular Budapest Christmas market in the heart of Budapest. There is no doubt that there will be several intriguing events on the scenic square as part of the Budapest Easter Festival. The annual Vörösmarty tér Easter market is a nice folk fair and cultural festival where you can try the Hungarian savoury snack (Langos), the simple and elegant pastry (Kurtoskalacs), Hungarian sausages, ‘hurka’ (something like the Scottish blood pudding), and see some folk events, world music concerts, folk bands, folk dance shows. Similarly to the Christmas handicraft stalls, the Easter market also offers and opportunity to get some nice handmade gifts, from jewelleries through leather gloves to home made, handcrafted Easter decorations and sweets. 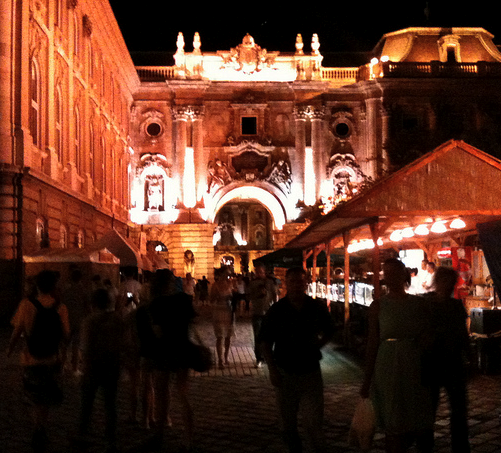 The festival is part of the Budapest Spring Festival, the biggest cultural festival in Hungary. Vajdahunyad Castle, the home of the Hungarian Agricultural Museum, has beautiful castle grounds where the Easter fair will let you try and buy some Hungarian Easter snacks, gits, etc. Usually there are some kids workshops and performances too. This Easter program may not be scheduled for the upcoming Easter festivities. Please check with the Museum of Ethnography for details. Easter at the Museum of Ethnography Budapest: the museum is the guardian of the Hungarian folk heritage, including the Hungarian Easter traditions (clothes, handcrafts, hand painted Easter eggs, retro photos of old time Easter holidays, etc.). The Budapest Museum of Ethnography, which is just opposite the Hungarian Parliament, has a special Easter Fair each year, with lots of Easter workshops, etc. During the Easter holiday some of the shops, tours and restaurants may be closed, but there will be some nice city cruises to enjoy. You can sit back and enjoy the riverfront scenery in Budapest with a glass of wine, champagne or juice, or even get some show or music aboard, as well as lunch, dinner. Booking your Budapest Easter Cruise in advance is recommended as the city will be visited by many tourists for an Easter break. The party of the Easter weekend is definitely the Easter Bath Party on Saturday night as part of the Budapest Bath Party series. More info about party dates, tickets on Szechenyi Baths Party page. The festival of Hungarian Folk Dances is for all who love to see and do dancing. This is the most important folk dance event for traditional folk groups all over Hungary and outside Hungary where Hungarian communities live in the neighbouring countries. 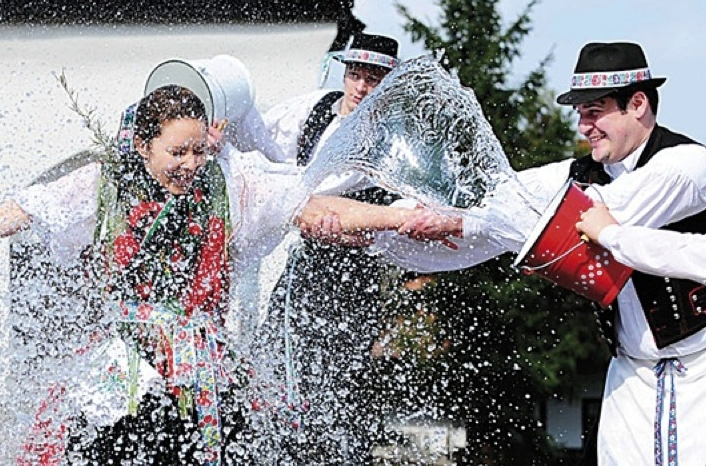 A lively, spectacular event, the least touristy you can get in Hungarian folk dances. 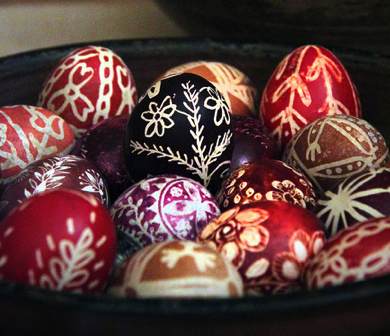 You can also see some Hungarian Easter traditions and artisan fare at the festival. Easter in Szentendre Skanzen: Szentendre is a lovely little town in the countryside. It lies about an hour’s ride from Budapest, by the river Danube. You can take the suburban train easily from Budapest (called the HEV) to get to Szentendre and change to the bus to get to an artificially restored Hungarian Folk Village, the popular Skanzen of Hungary, where all the major Hungarian regions and folk traditions, items, houses have been collected and put into a context of a never existing village, which still feels more real than ever. For families with kids and not so teen children, this is an ideal Easter destination in Hungary. You can also book guided Szentendre Skanzen tours or Szentendre city tours with private transportation, or Szentendre and Danube Bend tours (i.e. Szentendre, Visegrad, Esztergom as part of a Danube Bend tour). Easter in Holloko, a small village, now part of the World Heritage, is about 1.5 – 2 hour’s drive from the city of Budapest. 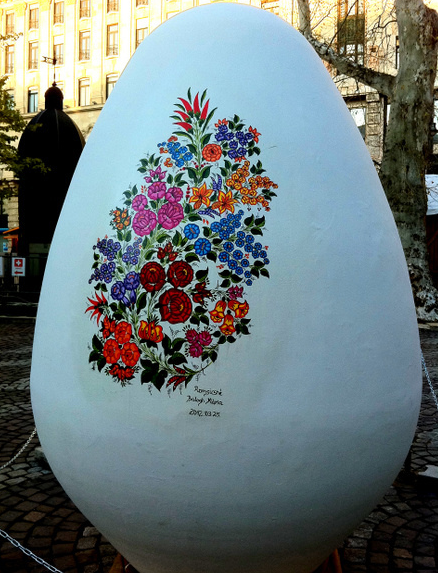 Each Easter the residents of Holloko show what a traditional Hungarian Easter looked like, how people celebrated Easter Sunday and Monday in the old days, what were the Hungarian Easter traditions (Easter sprinkling, painting Easter eggs, etc.). If you like authentic places and want to get to know a beautiful piece of the countryside, take a trip to Holloko at Easter time. Nyul village, the Hungarian village named after the Rabbit (Nyúl in Hungarian) throws a big Easter festival with all sorts of concerts and workshops, family programs and more. Vienna is so close to Budapest that you can easily hop over to Austria for a day visit. 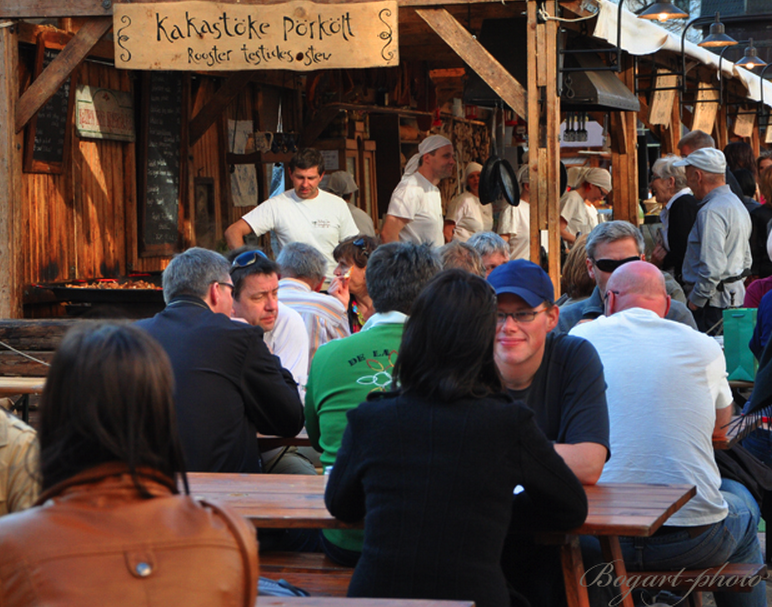 Wien boasts a nice Easter Fair, which may be well worth a visit, and so is the city of course. The train ride from Budapest to Vienna is about 3 hours by a fast and comfortable train. You can book Budapest Vienna train tickets online in advance at a very cheap price via the website of the Hungarian Railway company (the trips must start in Budapest, cannot start in Wien). Budapest tours: sightseeing, wine tasting, bike, bus etc. Budapest Events Guide: concerts, exhibitions, festivals, etc.